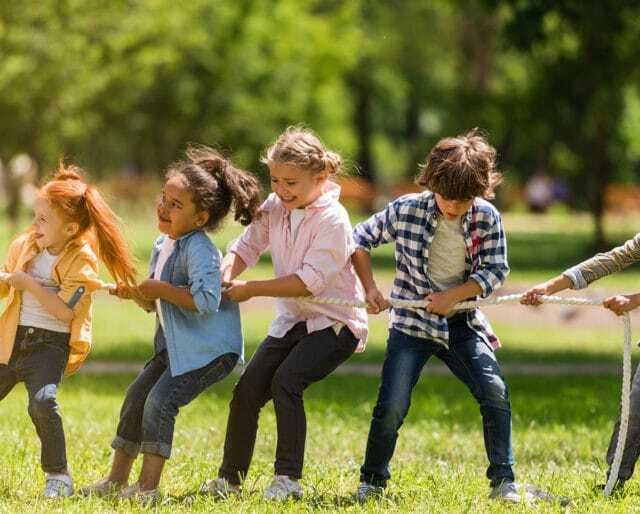 If your only introduction to the game of tug of war was at summer camp or in elementary school, you are in desperate need to celebrate Tug of War Day on February 19. Tug of war has grown up from the days of your youth. In addition to having its own holiday, tug of war has national and international federations that sponsor worldwide tournaments. And there are rules … lots of them.Fortunately, the international federation’s tug of war rules don’t have to apply to you if you’ve decided to relive your youth and find a tug of war game nearby. Tug of war is one of the simplest games to play. All you need is a long rope and anywhere from a few people to dozens of people. Heck, you can even play one-on-one tug of war with a short rope and your dog. (Just be prepared to lose; dogs are naturals at this game.) To play tug of war, place the rope in the middle of a field. Tie a cloth in the middle. Set up marker lines 10-20 feet from the center. Then split into teams and try to pull the cloth on the rope (and the other team by default) across your marker line. Simple enough. It’s great for building muscles and for fun. And be thankful that you don’t play tug of war the way ancient Vikings did, where they tugged on animal pelts stretched over a fire pit. The game’s losers received a hotfoot … or worse if they were unlucky. Official tug of war tournaments — yes, we said official — are held throughout the world during the year. The Tug of War International Federation and United States Tug of War Association web sites both have lists of tournaments held throughout the year. And if you didn’t know tug of war games were officially regulated throughout the world … well, don’t feel bad. You aren’t alone. Tug of war is so easy to set up and play that many small-town carnivals and other celebrations will include tug of war games … often in a field of mud. Want to prove to your boss that you’re participating in team building exercises? Convince your workmates to join a tug of war team at one of these celebrations. And maybe the boss will take it easy on you on Monday because of your sore muscles. As unlikely as it seems, ABC used to run a TV sports series in the 1970s and 1980s pitting the World Series and Super Bowl participants in a SuperTeams competition. During their off-season, the baseball and football players would participate with their teammates in sports such as cycling, swimming, rowing, and tug of war. There were some epic tug of war battles between these teams, including a 75-minute battle between the Dallas Cowboys and Kansas City Royals in 1978. Can you imagine millionaire athletes risking injury (like hand burns) in the off-season these days by participating in a tug of war game? Neither can we. Although tug of war doesn’t have an official date of invention, it’s obvious from ancient drawings that versions of tug of war have existed for thousands of years. Egypt, China, India, Japan, Korea, Hawaii, and Greece all have a history of tug of war games. Sometimes, participants would hold a stick instead of a rope. And sometimes they’d interlock arms and pull on each other. Ouch. One of the best things about tug of war is that it’s a simple game. You just need a length of rope and a group of people. You don’t have to have a specific length of rope and you don’t need a specific number of people. Wearing gloves to protect against rope burn is a good idea though. Tug of war can be a good way to build muscle and core strength as part of an exercise routine. Warriors in China trained using tug of war as early as the eighth century B.C. And if that was good enough for ancient warriors to prepare for battle, tug of war can be good enough as part of your modern battle against the bulge.